This way the brain does not send hunger signals buy paroxetine in the uk to..
Have fun while assisting in ADK’s efforts to provide a quality and safe camping experience at the Adirondack Loj/Wilderness Campground. You will be the on-site representative of ADK (Adirondack Mountain Club), sharing your enthusiasm and love for the outdoors. As a Campground Host you will greet campers upon their arrival, be accessible to assist campers, explain the campground rules, and assist ADK staff where needed. In return, you will receive a free campsite for up to two people, three meals a day, and free use of specific ADK facilities when available. Campground Hosts are selected on a first-come, first-served basis. Some of the criteria are: camping experience, public contact experience, available time, at least 21 years of age, and favorable health conditions that allow you to carry out the responsibilities. ADK membership is required. For more information please contact: Jon Bowen, Campground Host Coordinator, 315-638-8749. Assist ADK’s Information Center staff in their efforts to provide all visitors with a positive experience at the Heart Lake Property by assisting with parking, directions, and general information. 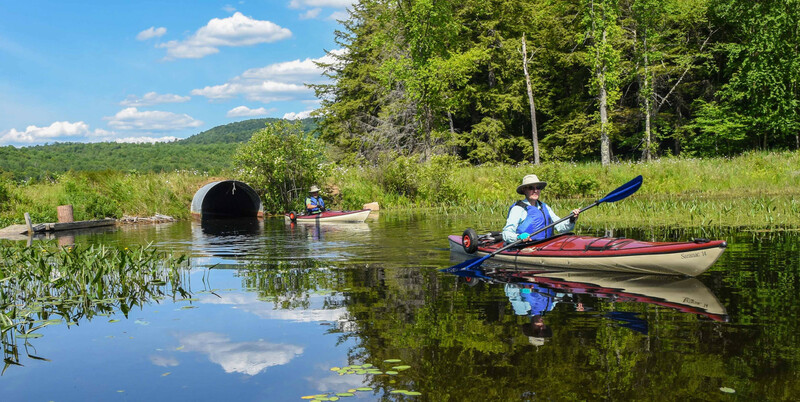 As an Information Center Host you will greet visitors, sell parking passes, provide directions, park cars, provide basic trail information, provide information about ADK and membership, and assist ADK staff where needed. In return, you will receive a free campsite for up to two people, three meals a day, and free use of specific ADK facilities when available. Information Center Hosts are selected on a first-come, first-served basis, based on the extent of their familiarity with the Heart Lake Property and surrounding area. Some of the criteria are: public contact experience, available time, at least 21 years of age, and favorable health conditions that allow you to carry out the responsibilities. ADK membership is required. Are you a current or retired educator looking to volunteer your time teaching others about the natural world this summer? Volunteer Naturalists support our interpretive programs at the Heart Lake Program Center by serving as Nature Museum docents, leading walks and talks, and even summit hosting on top of Mt. Jo. Volunteer training, uniform shirt, free parking, and lunch will be provided. If interested please fill out a volunteer application. Questions regarding this position can be directed to: Seth Jones, Education Director, 518-523-3480 Ext. 18. Would you like to share your passion and experience with outdoor adventures with others? Become an outings leader. Lead outings in your community or anywhere you wish to explore. Lead paddle, cycling, hiking, cross-country skiing, snowshoeing, trail running, or other types of outings. For more information contact Jules Greiner 518-668-4447 ext. 30.